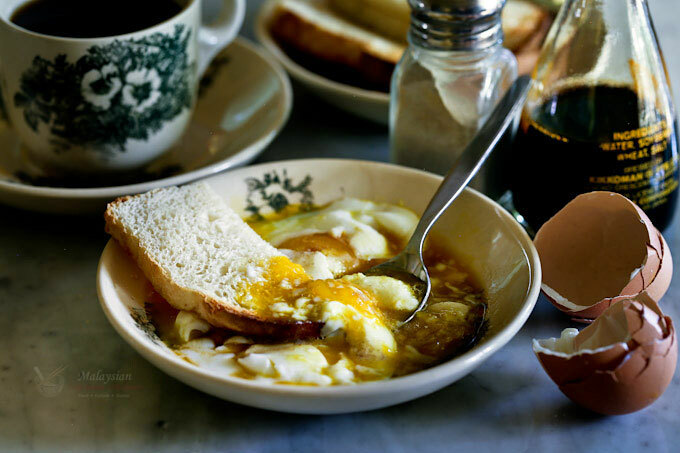 Half Boiled Eggs and toast are a favorite Malaysian breakfast. Learn how to cook them to a soft, creamy, and delicious perfection in a hot water bath. If you have lived in Malaysia for any period of time, chances are you have seen or even tasted Half Boiled Eggs with toast. This ubiquitous breakfast is a kopitiam (coffee shop) staple and a favorite of many. It is well loved by the young and old alike. In fact, some ate it regularly back in the days when eggs were not considered the “bad boys” of cholesterol. It was considered healthy, especially for kids to eat half boiled super fresh kampung (free range) eggs. After all, the humble egg is a complete food, is it not? After decades of “bad rap”, new studies now show that the caution may be an exaggeration. Whatever the case may be, it is probably unwise to eat a certain food every single day of the week. I love eggs but try to limit my intake to no more than 2 to 3 eggs a week. 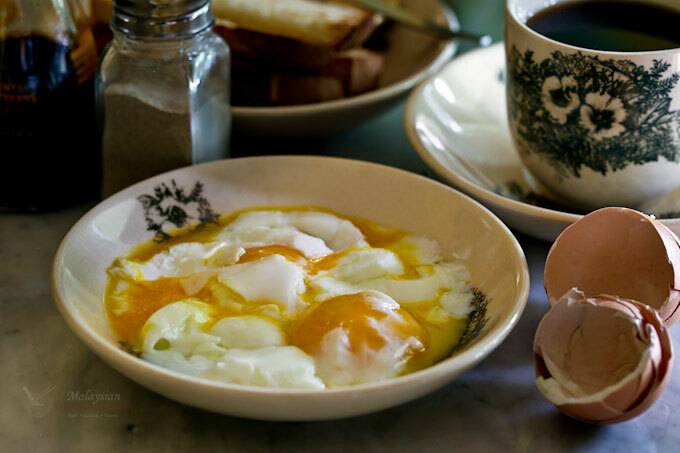 Traditionally, an enamel mug with a dome lid is used to perfectly cook these eggs. Over the passage of time, these enamel vessels have been replaced by their stainless steel counterpart. There is even a fail proof Half Boiled Egg Cooker which is a little hard to come by. Fortunately, a saucepan will suffice. When it comes to the eggs, use the freshest and “bestest” eggs you can find. Over here, I use large organic brown eggs which are about 57 to 64 grams each. In Malaysia, it is best to use kampung eggs if available. Kampung eggs tend to be smaller and cooking time should be adjusted downwards accordingly. Make sure the eggs are at room temperature. Remove them from the refrigerator 30 minutes before cooking. If you are short on time, simply rinse them with warm water from the faucet until they are no longer cold to the touch. In the video below, I show you two methods for making perfect Half Boiled Eggs. I hope you’ll give it a try. Bring 3 cups (720ml) water to a rolling boil in a 1½ quart saucepan. Turn off stove and remove saucepan from stove. Gently lower room temperature eggs into the hot water. Cover saucepan with lid and allow eggs to cook for 7 minutes**. 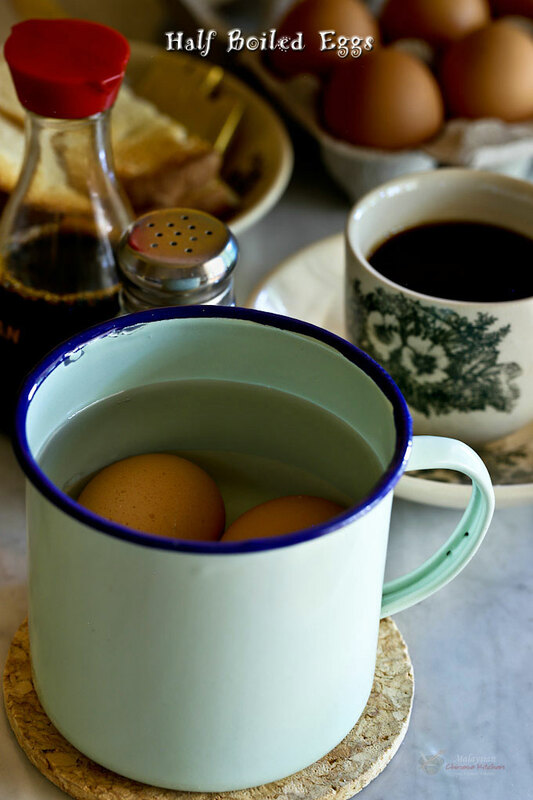 Place eggs in an enamel mug. Bring 2 cups (480ml) water to a rolling boil. Pour water into the mug over the eggs. Cover mug with lid and allow eggs to cook for 8 minutes**. Remove eggs with a slotted spoon. 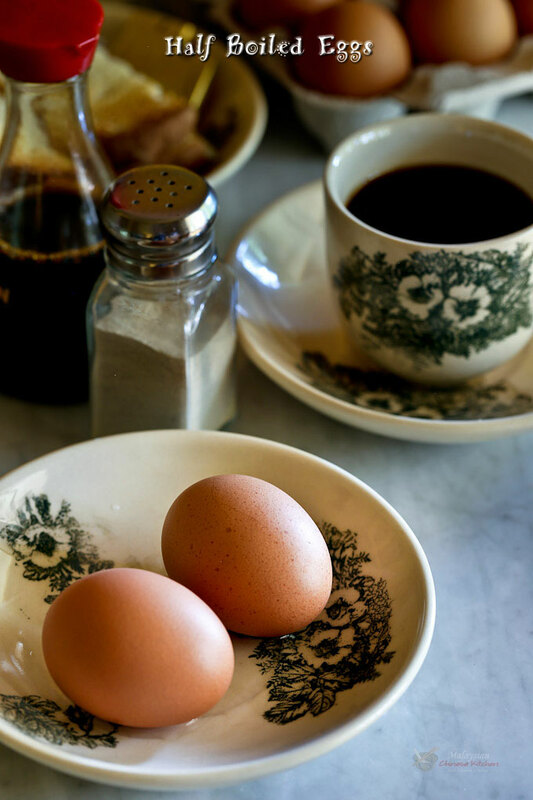 When cool enough to handle, crack eggs into a shallow bowl. Add a little soy sauce and ground pepper. Serve immediately with toast. **Cooking time can vary +/- 1 to 2 minutes depending on size of eggs. Thank you for the recipe. I spent about half of last month (August 2017) in Malaysia. I noticed folks would eat half boiled eggs and Kaya toast up for breakfast up until mid afternoon. I seemed to be the only one dipping my toast. Also Kopi-O is very strong black coffee with sugar. 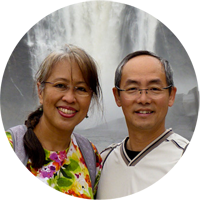 Do you have a recipe for Sarawak Laksa? Thanks. Glad you found our website. God bless!